You have added Secret Crush Crochet Lace and Mesh Dress in Neon Yellow into shopping cart. Your crush will notice you in this knockout lace crochet dress! We love the gorgeous detailing that went into this dress. The Secret Crochet Lace and Mesh Dress is lined at bust and skirt. The mesh detailing at neckline and waistline make these areas semi-sheer. The back of the dress is open and has double spaghetti straps that criss-cross. 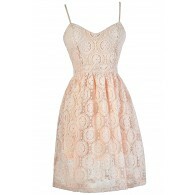 The dress has a beautiful flower crochet lace pattern with rose crochet detailing around the edges of the dress. It is completed with a hidden zipper in back of attached skirt. This dress is ideal to wear on date night, girl’s night out, or at the club. Your crush will notice you: the bright color makes this dress pop! Pair this dress with strappy or sleek pumps. Details: Lined at bust and skirt. Mesh cut-outs. Hidden back zipper. 93% polyester, 7% spandex. Lining: 100% polyester. Hand wash cold separately. Color will bleed. Hang to dry. Small measurements: Length from top of neckline to hemline 33”. Bust: 32”. You have added Secret Crush Crochet Lace and Mesh Dress in Neon Yellow into Wishlist. You have added Secret Crush Crochet Lace and Mesh Dress in Neon Yellow for Stock Notification. You have set Secret Crush Crochet Lace and Mesh Dress in Neon Yellow as a loved product. You have removed Secret Crush Crochet Lace and Mesh Dress in Neon Yellow as a loved product.